Migration for Cuckoos appears to be an even more risky business than we expected and, even with only five groups of Cuckoos to look at, it is obvious that there can be huge between-year differences in the challenges they face. To date we have tagged over 50 birds. Some of the losses throughout the project are, we think, associated with tag failure, rather than the death of the birds. Given that Cuckoo numbers in the UK are declining, one of the key aims of the project is to try to understand the circumstances that may be contributing to increased mortality. Knowing how and when we lose marked Cuckoos is as important as understanding their migratory journeys. Cuckoos tagged in the UK spend the winter in central Africa. For the first time this project has allowed us to follow Cuckoos to their wintering grounds which seem mainly to be in and around the Congo rainforest. Understanding where Cuckoos winter could be an important factor in determining the causes for their decline. 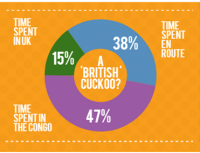 We discovered that Cuckoos leave the UK much earlier than we thought. The earliest departure date so far has been 3rd June andbut in each year over 50% of our tagged Cuckoos have left the country by the end of June, much earlier than expected! 15% of his time in Britain. .
We’ve found that Cuckoos arrive in Britain towards the end of April and beginning of May and many leave again during June. This means that Cuckoos like Chris only spend a small percentage of the year here. Chris spends roughly 47% of his time in Africa, 38% of his time is spent on migration and just 15% in Britain!. Our Cuckoos head out of the UK in a variety of directions, some due east across the North Sea to the Netherlands and Belgium while others head south across the English Channel into France. Tracking Cuckoos confirmed a migration route through Italy as expected from ringing data but two Cuckoos from the first year went west via Spain, highlighting a brand new migration route and a stopover site north of Madrid. 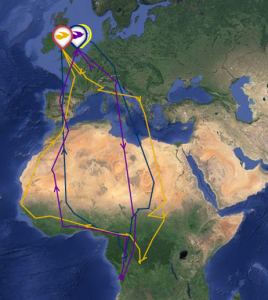 Read a summary of our findings so far regarding Cuckoo migration routes. Stop-over sites are important fuelling areas for migrant birds, often areas rich in food which allow birds to fatten up for the journey ahead. Many of our Cuckoos have spent time near the River Po in Italy, confirming this is a very important fattening site for British Cuckoos which allows them to cross the Mediterranean Sea but also the crossing of the Sahara desert at its widest point. All of our Cuckoos have crossed the Sahara each spring from previously unknown stopover sites in West Africa. It had been formerly supposed that Cuckoos crossed the Sahara in a mammoth flight direct from their wintering locations all the way to North Africa or southern Europe, so this stopover was highly unexpected. Understanding more about the location of important stop-over sites could be another crucial part of the conservation of this species. David and BB in 2013/14. The Cuckoos followed so far take a different return route to the UK than the one they followed on their outward autumn migration. No matter which route they take south, whether it be via Spain, Italy or further east, all the Cuckoos head to West Africa to make the return crossing over the Sahara Desert to Europe. This information suggests that there are good reasons why Cuckoos visit west Africa on their way back and this is another important aspect of their journey which could prove a pinch point in their success. Our Cuckoos take just under two months to complete the journey from their wintering locations to England. This is compared to the four or so months it takes them to reach their wintering locations on their autumn migrations. Their arrival back to the UK is important as they need to find a mate and ensure there is plenty of food at the time when youngsters hatch and are reared by host species. 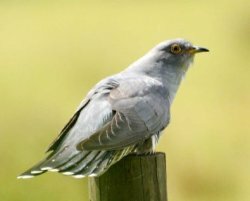 Having followed Cuckoos over a number of years we are beginning to gather a wealth of data about the difficult points during the Cuckoo’s annual cycle. Knowing where the birds are struggling (and dying) will help us understand how their numbers change and hopefully will help to identify the causes of their declines to help inform conservation in the future. In some years we have seen a number of cases where birds head south but return northwards soon after, retracing their steps, presumably because they could not find food and were returning to areas where they know. This is likely to be a survival mechanism. Increasing the number of individuals tagged, and following them for a number of years, allows us to answer new questions. Short-term studies can also give misleading results. For example the habitats that were used in the Congo basin by English and Scottish Cuckoos in the first two years are not the same habitats being used in later years. We can see whether birds that do ‘unusual’ things (i.e. winter in a different place or habitat to the other birds) survive better or worse than others, giving insight into what limits the normal range of the population. Continuing to collect data allows us to examine survival and patterns of mortality and also how increasing age affects migratory performance, as well as whether environmental variations, such as in the timing and amount of rainfall in both European and African stopovers, has any affects. If you would like to help support and develop the project, you could become a Cuckoo sponsor for as little as £10. You will receive email updates on the Cuckoos' progress and your name will be featured on your chosen Cuckoo's blog. Find out more about Cuckoo sponsorship here. The information gathered as part of this project will be vital in informing the conservation of the Cuckoo in the UK.